Tung-Fang Elementary school is a quaint school located in the agricultural and industrial area of Changhua City. It is filled with many smiling faces, rainbow arches and murals, and inspirational English phrases. The school has a history of over 70 years and comprises of grades Kindergarten through 6th grade and nearly 600 students. Every day you can see the students smiling in the halls, running on the race track, or practicing their speeches for the English competitions. As soon as arriving Dacun, I am immersed into the culture of this cozy township. Within seconds of stepping onto the Dacun train platform, decked with images of grapes, the importance of the winter grape harvest to the community is evident. The importance of this local produce is also integrated into the curriculum and life of Dacun Elementary. Every year, there is harvest of their own grapes, all while learning about the process of tending crops and connecting those lessons to their local culture. In addition, Dacun Elementary also stands out for its efforts to integrate English language learning into many parts of the students’ daily lives. Despite the lack of English exposure outside of the classroom, Dacun students strive to learn in the classroom, thus, making Dacun a huge asset to the local people. Overall, Dacun Elementary provides a relaxed environment with a strong sense of community bred from the faculty and staff as well as the parents and other local community members. Yuanlin Elementary School just celebrated 120 years! It has about 2,000 students and 150 teachers. They have many extra-curricular activities, like art, diabolo (Chinese yoyo), swimming, and more. The school is right in Yuanlin and it is so fun having students yell hello to me out of cars and off scooters as I am walking home from school. The school is a tight knit community and the staff are so welcoming. 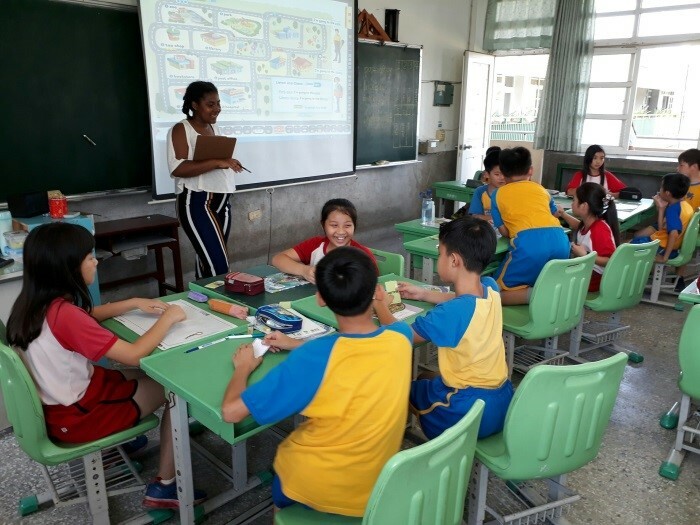 For the past 67 years on the outskirts of historic Lukang, Xishih Elementary has been providing an education guided by Confucian principles of humanity, loyalty, and filial piety. With this foundation, students learn to make their small familial community a wonderful school for all children with the passion to ultimately make a wonderful world for all people. Ershui Junior High School is a small school with approximately 200 students including grades 7 through 9. Situated in Ershui township, the school is surrounded by lush mountains and rice fields. The school grounds have a rock wall, which the students climb on for competitions, as well as occasional monkeys that come from the mountains. The majority of students are the children of farmers in the community, and so agriculture is a strong focus within school curriculum. Swaying the school’s many trees, an ocean breeze usually runs through Fang Yuan Middle School. Although only 215 students attend Fang Yuan, their energy, ambition, and creativity give off a great life. Frequently joining teachers at their office desks to ask or answer questions, students learn outside the classroom as well. Along roofed cement walls out back, students develop the practical art of building houses with brick and mortar. After school, the baseball players throw balls around the track, and you can hear drums coming from the gym where the dragon dancing team practices. On top of academic curiosity, Fang Yuan students have many unique talents from calligraphy to unicycling, and the teachers work tirelessly to maximize that great potential. Tianjhong Senior High School is a public high school located in Tianjhong township. With class sizes ranging around 30 students per class, around 1350 students attend the school. The school is located in the heart of the township, with agricultural fields and the train station acting as its surroundings. In addition to academics, Tianjhong Senior High offers a number of extracurricular activities not limited to martial arts, archery, and basketball.